A few weeks ago, we were asked by Tara Mataraza Desmond and Joy Manning to participate in a virtual potluck in celebration of their recent cookbook, Almost Meatless: Recipes That Are Better for Your Health and the Planet. I like the book’s concept — use less meat in recipes and replace it with novel ingredients to make them healthier without having to completely eliminate meat altogether. We had previously made and enjoyed the Albondigas, so this time we decided to tackle a recipe we’d never made at home before: Gyros! Rather than solely containing lamb shaved off a vertical broiler, this version uses a few slices of grilled leg of lamb steak, filled out with ful mudammas, a garlicky, zesty Middle-Eastern bean-spread. 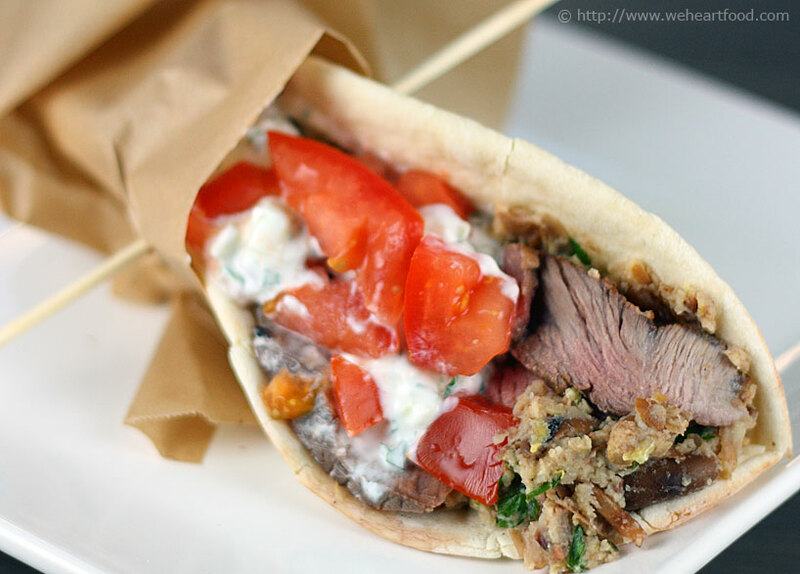 It’s then topped with cool tzatziki and tomatoes for a great combination of texture and flavor.